With the extensive amount of cheese and crackers at The Dep, it's hard to narrow down the pairing options. Because this can sometimes be a little overwhelming, we've started carrying a new line of flavorful English crackers that just so happen to share their expert knowledge right on the box. Yep, that's right. The Fine Cheese Co. not only tells you which cheese to pair with what cracker, but it also gives you a glimpse into what the crackers themselves look like. So next time you're in a rush to get to a dinner party, or just too exhausted and need a little pick me up - check out this new delightfull line. In the picture above, we did a sampling in the shop and paired our bloomy Fromage De Meaux with some of the crispy and flaky Chive Crackers - it was an absolutely delicious and well-balanced combination. And if you're looking for something to pair with some hard, nutty, and salty cheese like our Parmigiano-Reggiano or the oh-so-robust Pecorino Toscano Stagionato Dop. Then you'll want to try the Extra Virgin Olive Oil and Sea Salt Crackers. Or maybe you're in the mood for some our softer cheeses like a nice little bijou or our triple cream delicacy - the Brilliant Savrarin. 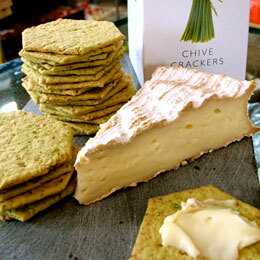 If that's the case, then you should try the light and airy Rosemary crackers that are laced with this aromatic herb. And if those aren't doing it for you, and you want something in the middle, like a Comte or Gruyere, then you'll definitely want to try the Basil speckled crackers which pair perfectly with the supple, fruity, and nutty flavors that are present in these raw cow's milk cheeses.